A study commission by The Environmental Working Group (EWG) suggest that nonstick pots and pans coated in Teflon can be dangerous to our health and the health of our pets. The synthetic chemicals that make up Teflon (called PFTE) are released into the air when nonstick cookware is overheated. These toxic fumes may kill pet birds and cause people to develop flu-like symptoms (called "Teflon Flu" or "Polymer fume fever"). The chemicals that make up Teflon belong to the perfluorinated (PFC) family. The EWG reports that PFCs have been found in nearly all Americans. They are associated with smaller birth weight and size in newborn babies, elevated cholesterol, abnormal thyroid hormone levels, liver inflammation and weakened immune defense against disease. Teflon manufacturers DuPont claim the chemical coated cookware is safe because normal cooking temperatures aren't high enough to release toxic fumes. Even according to the data shared by EWG, it does look like you need to reach some pretty high temperatures for the chemicals to become airborne. Still, these temperatures aren't exactly uncommon. I know I have accidentally burned pots by using the wrong burner or forgetting about a pan that I was preheating. What are we supposed to do about this? Besides becoming raw vegans, we can swap our Teflon cookware for safer options. At my house we use stainless steel cookware. I bought this set of T-fal copper bottomed stainless-steel cookware on Amazon pretty much as soon as I learned Teflon was dangerous. I've had it for about three years and I'm really happy with my purchase. The one weird thing is the large frying pan doesn't have a lid to fit it but besides that it's great. Things do stick to it, but I know several ways to clean food stuck to pans, so it's not a problem. We also use four cast iron pots and pans. One is a ceramic coated cast iron dutch oven pot (similar to this one). It's perfect for lentil chili! We have two preseasoned Lodge frying pans. We use the large skillet for sauteed veggies, tofu scramble, and deep dish pizza. My boyfriend uses the mini skillet for his omelets and fried eggs. We also use a Lodge grill pan to make awesome sandwiches and hot dogs. 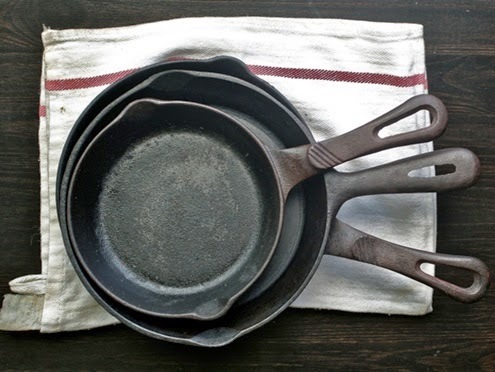 It's really easy to care for cast iron cookware. Another healthy cookware option is Xtrema 100% ceramic cookware. 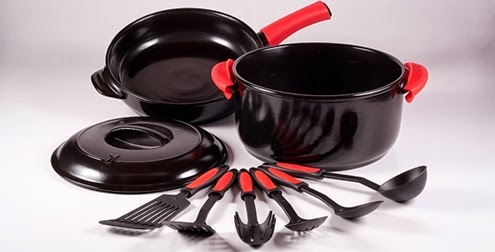 I don't have any personal experience with this type of cookware but consumer product toxins watchdog Debra Lynn Dadd offered a video testimonial for Xtrema cookware's safety. Sadly, the Xtrema Skillet reviews on Amazon weren't very good. The Xtrema saucepan had only one Amazon review but the customer seemed happy with it. Still, I'd like to buy some of their bakeware to replace my old nonstick cupcake and loaf pans based on Debra's recommendation. Would you rather not sautee your organic kale over toxic chemicals? Does the information about Teflon freak you out? What kind of cookware do you like?